Dr. Ed McCrea physician; Dr. James Plihall, dentist, and others to be added. 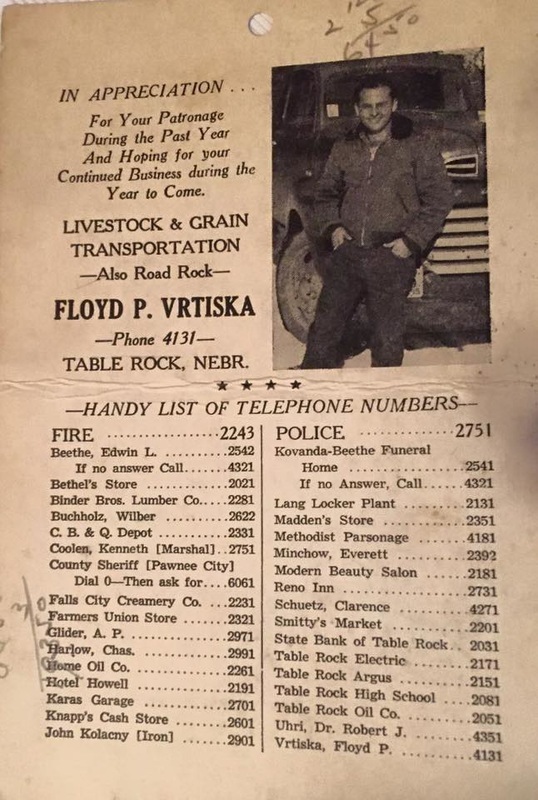 This undated listing of businesses given out by Floyd Vrtiska serves as a reminder of those in business in Table Rock -- probably in the early 1960s. Wilber Buchholz had a shop west of the Methodist Church, Dr. Glider had a chiropractic office in his home on the west side of town. Charles Harlow and Clarence Schuetz obviously had services, but someone with a good memory needs to weigh in on what they did. DRUG STORES, GROCERY STORES, MEAT MARKETS, MISC.